Characteristics: Flat, hard bodies. Long hind legs. Fleas are very small (1/6-1/12th of an inch in length) parasitic insect that feed on the blood of warm-blooded animals. Reddish-brown in color, they will become redder after feeding. Fleas have a flat, hard body and six legs. Their hind-legs are very long and powerful and are used for jumping; in fact fleas have an impressive eight-inch vertical jump from the ground. Fleas typically arrive inside on pets. In their wanderings outside, dogs and cats pick up fleas that were introduced by passing wildlife. 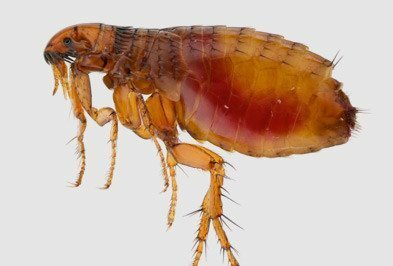 Unfortunately, fleas aren’t just a problem for households with pets. If you spend any time outside, you may inadvertently pick up fleas on your clothing or person and bring them inside. It’s also possible for fleas to jump in. How do I know if I have a flea problem? If you’re pets are scratching excessively or biting their fur, you probably have fleas. You may also notice black flecks of “dirt” in your pet’s fur or on their bedding or other areas where they hang out. Another indication of a flea problem is finding unexplained bites on you or family members. Flea bites most often show up on feet and legs. They look like small raised red bumps that have a reddish halo around each bite. Bites are extremely itchy and may cause discomfort. Are fleas dangerous to pets and humans? Yes, fleas can be dangerous to both people and pets. Fleas will feed on a variety of hosts throughout their life and therefore have the ability to transmit a variety of dangerous diseases and parasites. Fleas are known to spread plaque and murine typhus and are intermediate hosts for dog tapeworm and rodent tapeworm. First, you must treat your pets. We recommend contacting your veterinarian to see what type of flea products or treatments they advise. You should also seek out professional flea control. At Holder’s Pest Solutions, we offer one-time flea treatments. This service includes 1 – 2 follow-up treatments if necessary. We also provide monthly flea control services to help fight an ongoing flea problem. How do you prevent fleas in the house? Don’t let pets sleep on beds or hang out on furniture. Vacuum carpet and other areas where pets spend time. Discourage wild animals from visiting your property by removing potential food sources like bird feeders. Seal any holes or gaps on the exterior of the house to prevent mice (which are often hosts to fleas) from coming in. Check yourself and pets for fleas before coming inside.